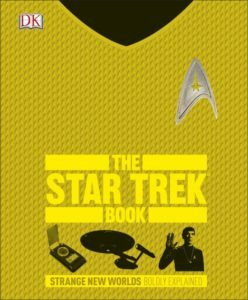 Win The Star Trek Book – Celebrate Star Trek’s 50th Anniversary! To celebrate the 50th anniversary of the very first Star Trek episode this week, we’ve teamed up with DK to giveaway this awesome essential guide to all the films and TV series in the Star Trek universe. Boldly go where no one has gone before to discover all things Star Trek. Explore every era of the Star Trek movies and TV series in detail, featuring everything from visionary technology such as communicators and warp drive, to iconic spacecraft such as the Starship Enterprise; from alien species like Vulcans and Klingons, to well-loved characters such as Captain Kirk and Spock. Discover the astonishing science of the Star Trek universe and how it inspired and influenced real-world technology, such as the flip phone. The Star Trek Book is the perfect souvenir to celebrate 50 years of thrilling adventures on the final frontier. For a chance to win this awesome hardback book, just enter the giveaway via our competition app below! The competition ends at 23:59 on 21 September 2016. The prize consists of a The Star Trek Book by DK.